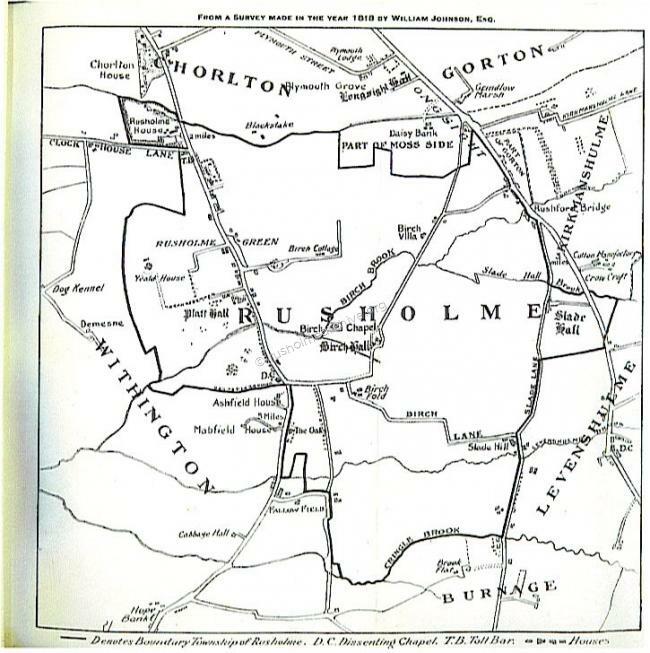 In this map below of the early 19th century the most obvious point is the absence of Longsight & Fallowfield. 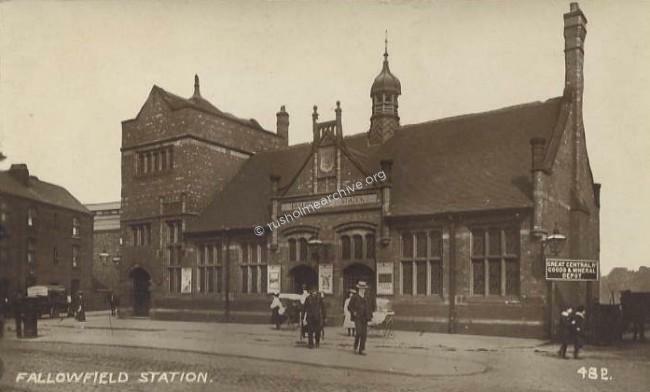 It was at least another 25 years or more before Longsight really evolved. 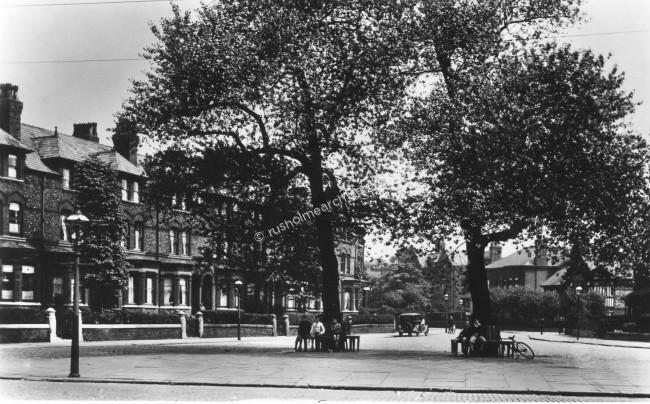 Thus in some of the areas of what we now consider Longsight are the names associated with Rusholme; Birch & Birch Hall Lane, Daisy Bank Rd etc. Whilst the majority of illustrations in this website are within the present ward definitions of Rusholme they do quite unashamedly stray - recognizing that Whitworth Park so very closely straddling the border with Chorlton-on-Medlock, Birch Hall Lane is now in Longsight & Wilmslow Road leading into Fallowfield. There are some examples below. The postcard below was posted in 1908 and probably shows the Baths not long after their construction in 1906. Certainly in the foreground the land is undeveloped and one wonders if the sign on the right is offering the land for sale? 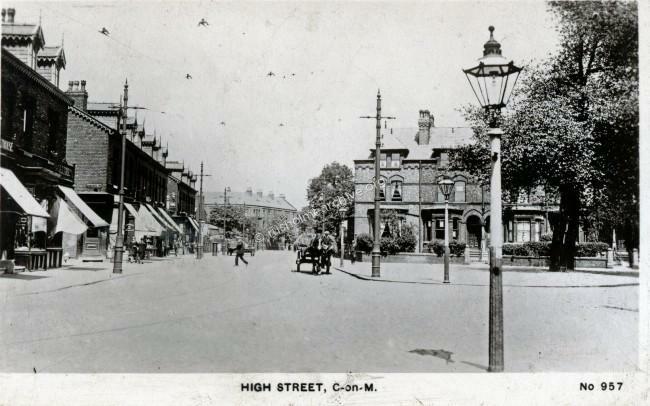 High Street and Baths, rather later than postcard above. 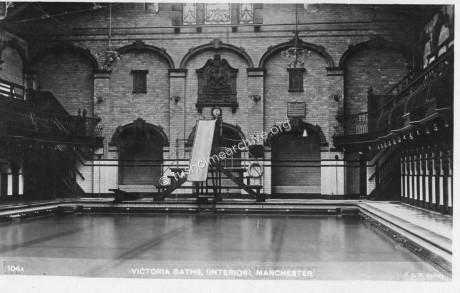 The Victoria Baths on High Street, (now Hathersage Road), were opened in September 1906 for the residents of Rusholme, Longsight & St Lukes. 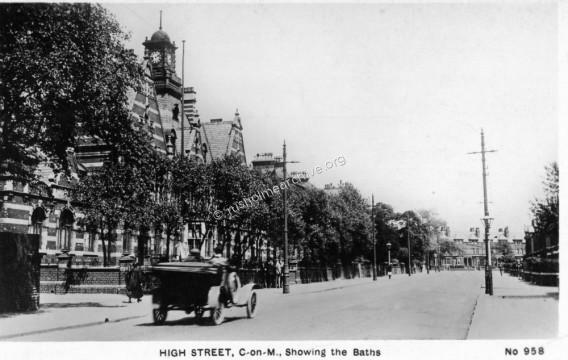 Built on the site of the Victoria Park Lawn Tennis Club they were described as the most splendid municipal bathing institution in the country. The cost had been very high, some £59,000, against an estimate of £34,000 and even that figure of £34,000 had been described as excessive! Water for the 3 swimming baths came from a borehole 760 feet deep that had been sunk on the site. This provided nearly 16,000 gallons of clear water every hour! Despite the controversy about the cost within a month of opening they were described as a phenomenal success, there being more than 20,000 visitors in this period. The interior view below is probably from the 1920's. The baths are no longer in use having been closed in 1993. 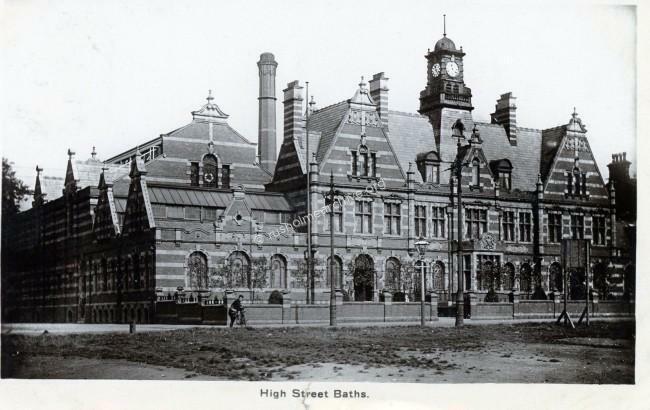 There is a more detailed history that can be read on the Victoria Baths website, where you can also read about how the Victoria Bath Trust is working on a comprehensive plan of restoration. Description of the High Street area circa 1880(?) by Miss Jessie Chadwick. Jessie was a pupil teacher at St Chrysostoms School. This school had been founded in 1876 just north of the Rusholme border in Chorlton-on-Medlock on Clarendon Road, (now Carmoor Rd but within the parish of St Chrysostoms.) 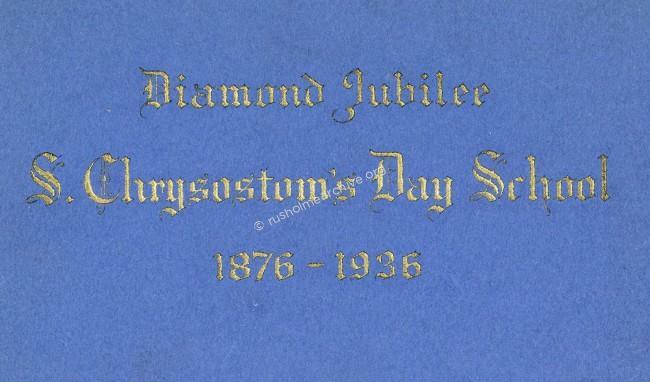 The school celebrated its first 60 years by publishing a small booklet that recalled the past 60 years and in particular the first few years in the late 19th century. 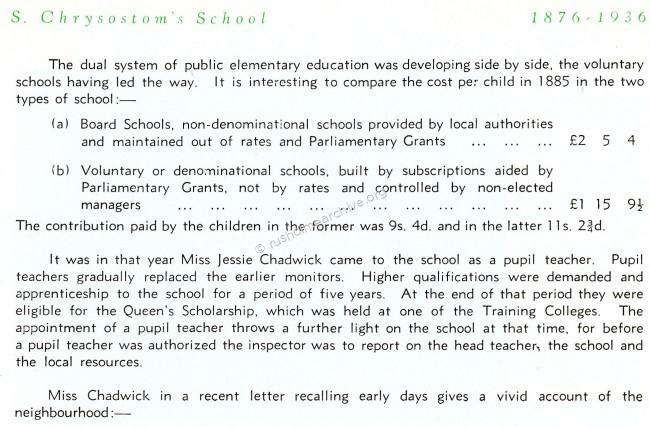 Page 7 of this booklet refers to the cost of running schools in 1885 and then a reference to Miss Chadwick. "Upper Brook Street was vastly different in those days, (Click on the thumbnail right). We lived in February Street. Only part of March Street was built; for the rest nothing but fields and a good-sized farm where the College of Domestic Economy now stands. Towards town the same big house next to 290 and nothing but fields till one came to a farm where the Bowling Green Hotel now stands. On the other side the Armenian Church, then fields, right away to High Street. My colleague, Maggie Hart, came to school from the corner of Alexandra Grove and Plymouth Grove across the field. There was a big farm where the Baths now stand. Maggie Hart was afraid of the geese and carried bread to throw to them to occupy their attention till she got past. During winter weather she had to come down to Lincoln Grove, where a few houses were then built, and along the cutting which became Clarendon Road. Upper Brook Street was quite out in the country then. 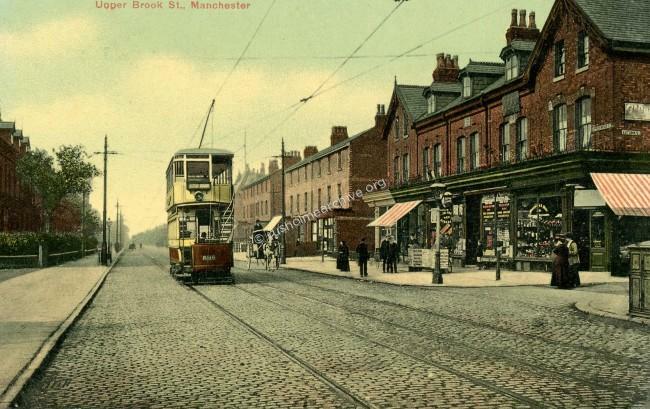 There were no shops nearer than Brunswick Street." If you would like to read the entire booklet you can download it as a PDF file - you will need Adobe software to open the file. Below is a map of the area in 1874, this has been kindly loaned to me by Eric Rowlands, there is a link for his website underneath the map, artus-familyhistory.com. Eric Rowlands lived in Blackstock Street and attended St Chrysostoms School - but rather later than the period that I have written about! 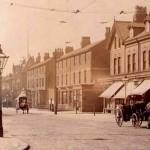 Below is a selection of photographs taken in the High Street area between 1903 & 1930s. 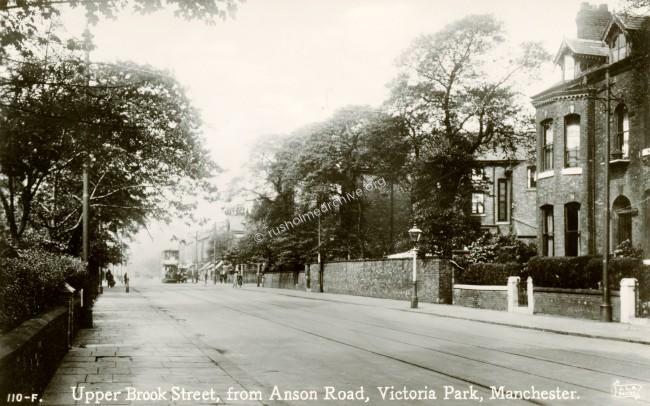 In the postcard view below note that the tram tracks did not turn into Anson Road on the right - trams were not allowed through Victoria Park until 1920. The postcard view below is undated, but clearly later than 1920 as there are tram tracks in the road. 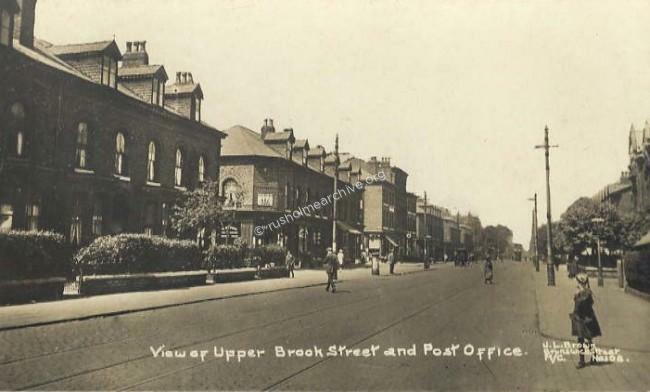 In this postcard view below of Upper Brook Street on the extreme right is Autumn Street, the next street is called Summer Street and finally Spring Street before you arrive at the Blackstock Hotel, (named after the farm that was in this district). There does not appear to have been a Winter Street!. 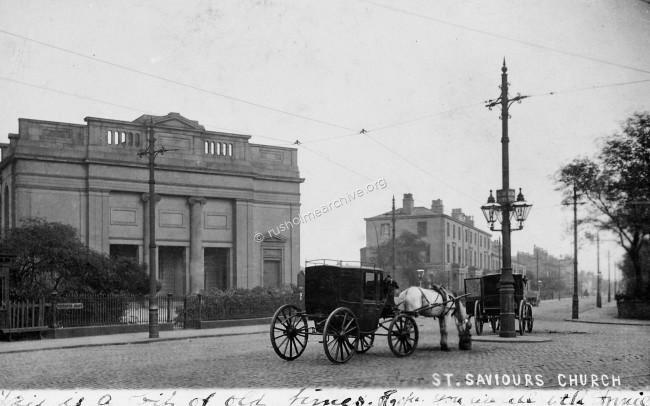 Unashamedly this picture below is some way from Rusholme, it is at the junction of Plymouth Grove & Upper Brook Street in 1907, but it such an timeless photograph that shows the original St Saviours Church, demolished, I think in the 1960's. 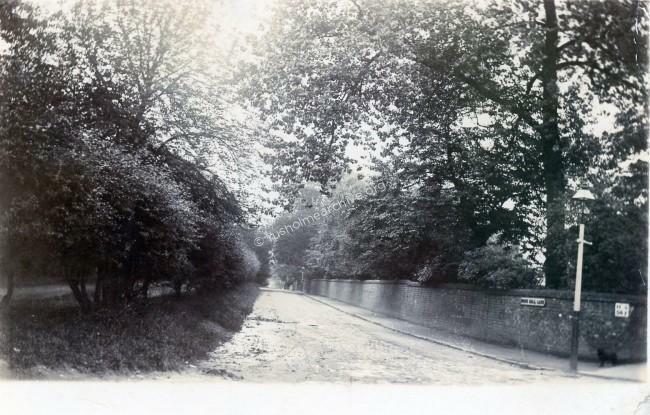 This view of Birch Hall Lane above is probably looking in a southerly direction, there appears to be on the extreme right of the card the entrance to 'Beckfoot', another of the fairly large Victorian mansions built in this area. There is a splendid country feel to this lane even as late as the date of the card, 1906. 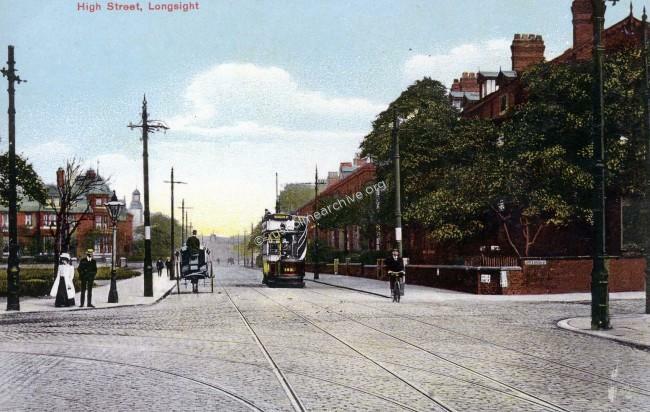 If you would like to read more about Longsight follow the next link - 'Longsight Memories' will be particularly of interest to former Longsight residents. Remember to click your 'back button' to return to this website!